Lost Outpost is a Salmon Run exclusive online multiplayer stage in Splatoon 2. It was made available at The Shoal with the release of Version 1.2.0 on 23 August 2017. It first appeared in the Salmon Run that took place from 27 August 2017 at 00:00 UTC to 28 August 2017 at 06:00 UTC. Lost Outpost features a walled off building surrounded by various docks. Directly in front of the building lies a completely netted area. To the right is an uneven slope down to the water. To the left, are three varying docks. During low tide, another dock behind the building is revealed, consisting of various walkways and grated paths. 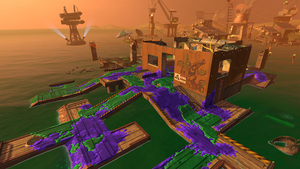 The Outpost: The center of the map has a building with 3 main doorways, and Salmonids can only come through those doorways, with the exception of Maws that can swim up walls. The walls are inkable and you can swim through the windows located around the building. The following directions apply when your back is against the egg basket. Fishnets: Directly in front of the outpost is an area consisting of only a large fishnet making turning into a squid or octopus impossible. Piers: To the left of the outpost are three docks which lower down to the water. Sandbar: To the right of the outpost in uneven terrain leading down to the water. The sandbar is divided by a few concrete pillars. Vegetable towers: Sausage tower on the sea to the left, asparagus tower on the sea in front, and corn tower on the sea to the right. All stages have the three floating vegetable-themed towers with two searchlights that serve as landmarks. During high tide, only the outpost building itself and the platform immediately surrounding the outpost will remain. During low tide, an entirely new area will appear behind the outpost. This area consists of multiple paths with lead to individual docks or a central platform connected by grates. The internal codename for this stage in the game files is "Shakehouse". Kaijō Shūraku Shaketo-Ba Shaketo-Field the Colony at Sea. Saketoba is Japanese salmon jerky.